Hello! 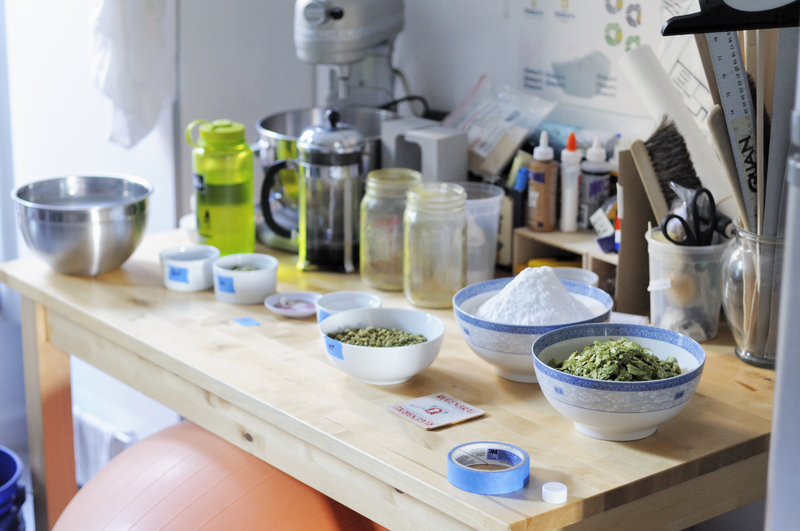 It’s Jessie, the homebrew wife here at The Pour Report, and I have some exciting news to share. 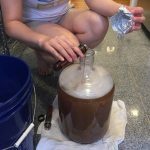 I’ve brewed my first batch of beer! The homebrew wife’s first mash! 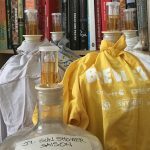 Having been tangentially involved over the years, the thought of actually brewing up a batch of my own is a recent occurrence. I have attended various beer-centric events, gone on many a beercation, and chatted endlessly with Nick, but had mostly stayed out of the brewery. When I attended my first full national homebrewers conference in 2015, it was the history seminars that piqued most of my interest. Although I attended some of the more technical seminars, I did find them a bit over my head. So in preparation for Homebrew Con 2016, I decided to read Randy Mosher’s “Mastering Homebrew”. (Thanks for the book, Sarah!) Doing most of my reading while riding the subway to and from work, I found myself thinking over and over how much better the information would stick if I could get some hands-on experience. While I was able to conjure up images of Nick doing what Randy was describing, there’s nothing quite like getting your hands dirty. So it was decided that I was going to have my first brew day. Going in, I knew that I wanted something light with a very low ABV (I’ve been “blessed” with wonky genes, which makes me a bit of a featherweight). And as I hold tart beers close to my heart, why not make one for my first brew? 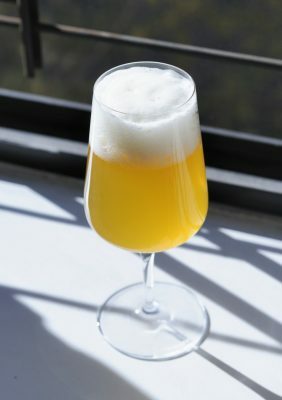 With my newly gained knowledge from Randy and some consultation from Nick, I put together my recipe (see below) with the hopes of creating a tart, crisp, and slightly fruity beer. You’ll see Clarity Ferm listed in my recipe. In addition to having poor drinking genes, I was also told about a year ago I have a gluten sensitivity. 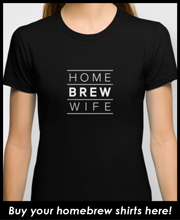 (No, the irony of a homebrew wife who doesn’t do well with either alcohol or gluten is not lost on me.) 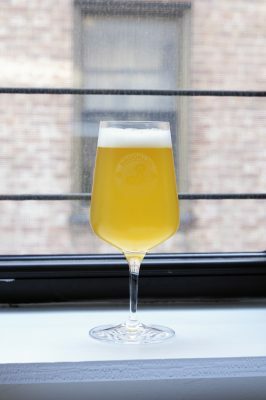 And since Nick has been wanting to play with Clarity Ferm but has not yet had the chance, we thought it fitting to use it in my beer. 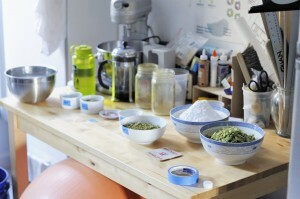 With a date picked and ingredients ordered, a bit of nervousness started to set it. Headed into my first brew day, I had some minor concerns about how it would all play out the day of. 1) My complete and utter lack of culinary prowess: I can make a mean scrambled egg (and once made penne vodka from scratch), but that’s about where my capabilities max out. I’d like to think I have a pretty good feel for certain things, but I know for sure that I have zero instinct when it comes to cooking. As I have often said to Nick, I need “very explicit instructions” when in the kitchen (or in this case, the brewery). 2) Stepping into Nick’s domain: despite being both excited for me and very encouraging, I also know that Nick has very specific ways of doing things and a very high standard for everything that he does (as evidenced by his numerous accolades). The actual working together part of it didn’t really worry me (we’ve collaborated on various projects in the past); it was more about not living up to his very high brewing standards. Plus, I didn’t want to be responsible for breaking any of his equipment. 3) Lack of technical knowledge: while I had no problem conceptualizing the beer I wanted to brew, I wasn’t quite sure how I was actually going to get from recipe to fermented beverage. Luckily, my first brew day was going to be a tandem brew with Nick. 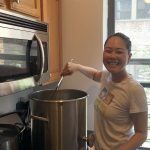 The brew day itself actually went remarkably smoothly (just one of the benefits of brewing with someone who knows what they’re doing!). Slightly flustered by the initial mise en place and set up of the brewery, the bulk of the brew day went pretty much according to plan. I have to admit I was a little surprised at how much down time there was (I’m looking at you, 90-minute boil). But it did feel like the cleaning of equipment was endless and, boy, that hot water sure is HOT (even through those Blichmann rubber gloves). But cleanliness is next to godliness and a must for any decent brewer. 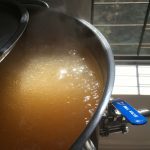 1) Mashing in high: because we started at such a low gravity (1.038), we mashed in at a higher than typical temperature (158°F) to try and keep the attenuation from being too high. 2) Tracking the mash: our initial mash pH was 5.3. Post boil, the wort was further acidified to pH 4.5 to prevent the lacto from enzymatically degrading the foam positive proteins. By Day 2, the lacto had acidified the wort to pH 3.24 and dropped the gravity to 1.019. 3) The fermentation schedule: pre acidification on Day 1 with the French Saison yeast + Clarity Ferm being pitched on Day 3. And to finish off the beer, three days sitting on one ounce of Galaxy hops post-fermentation. 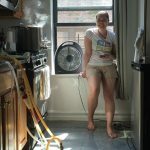 Having survived my first brew day, I am now even more impressed with all of the homebrewers out there pursuing this hobby. Cheers and Happy Homebrewing! Beautiful boiling wort on a sunny afternoon. Downtime during the boil gives you the chance to play on your phone and take photos for blog posts. Watching recirculating wort can be quite mesmerizing. Sun Shower meets the rest of the Pour Report family. 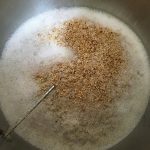 Take a ridiculously hoppy double IPA, increase the hopping and alcohol to ludicrous levels, and you have a decent outline for crafting a triple IPA. These are fun beers to brew, and a great way to use up any extraneously hops that may be buried in your freezer. 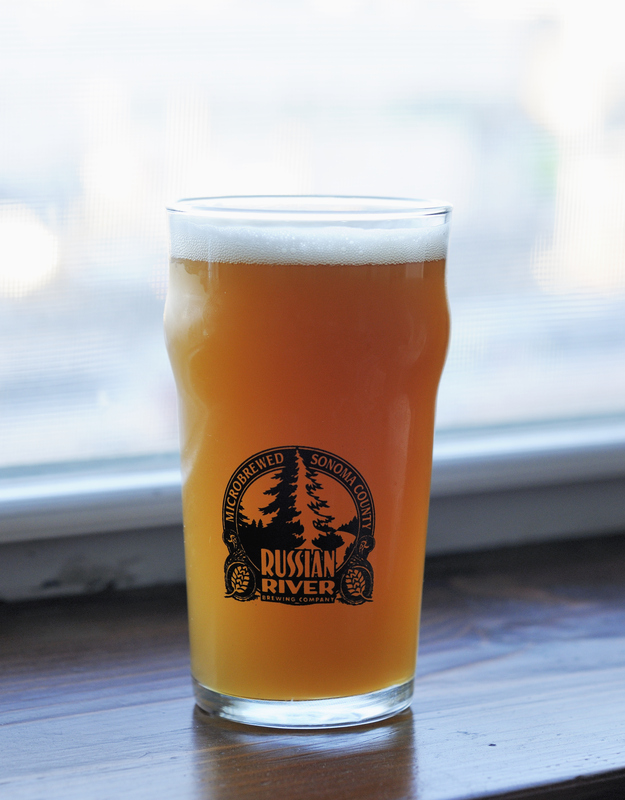 This beer is very much in the same spirit as coveted beers like Pliny the Younger (you can read more about my club’s attempt at cloning the Younger, here). This is a tough beer to brew as it can easily fall victim to common faults. The most frequent and egregious fault with American-style IPAs is not achieving adequate levels of attenuation. Nothing ruins a big hoppy beer’s drinkability quicker than excessive residual gravity or caramel flavors. This is even more apparent when you’re pushing the beer to triple IPA levels. Controlling fermentability with the addition of simple sugars and low mash temps will take you most of the way. 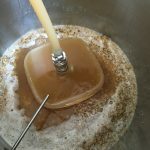 From there, it is key to pitch a big healthy population of yeast, adequately oxygenate the wort, and carefully control fermentation to keep higher alcohols in check. The second most common fault would likely be harsh or grassy hop flavors. 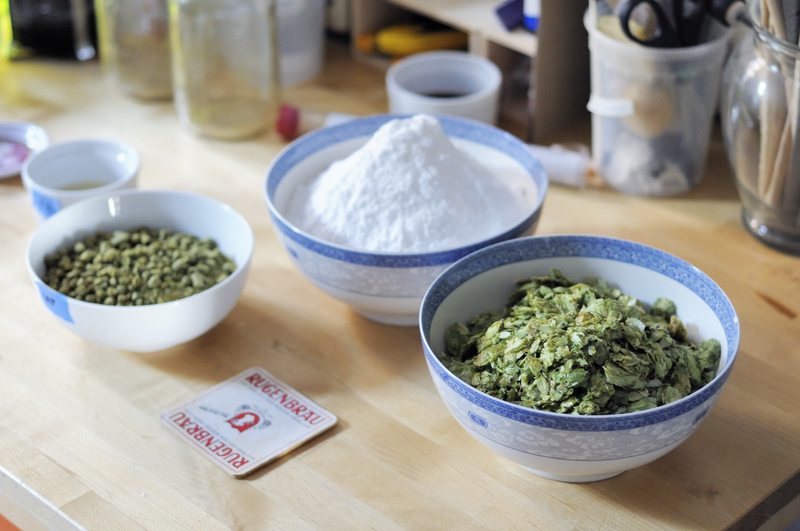 This most commonly occurs when brewers leave dryhops in contact with the beer for excessive periods. Many sources cite the fact that the majority of hop oils are extracted within the first 24-48 hours of contact with our beer. Anecdotally, I’ve definitely experienced this and typically now only leave dry hops in contact with my beers for 2-3 days, maximum. Lastly, it is extremely important to limit oxygen pickup post fermentation with your hoppy beers. Hop compounds are extremely susceptible to oxidation. Very few factors will contribute to the destruction of a hoppy beer quicker than oxygen. Purging vessels, pushing beer with C02 in closed loops, and cold storage can greatly increase the shelf-life of your hoppy beers. WYeast 1056 American Ale™ – Large starter on stirplate to achieve 1 million cells per milliliter of wort per degree Plato. Use Mr. Malty to determine proper starter sized based on age of yeast package. Pitch into 60°F wort and allow to free rise to 64°F. As fermentation begins to slow, raise temperature to 70°F. Huge, punchy hop-nose. The hops are extremely juicy and tropical — reminiscent of mango, orange, and pineapple. In many ways, this beer reminds me P.O.G. (passion fruit, orange, guave) juice. There is a moderate amount of grassy, plant-like aromas. By and large the hops are almost uniformly fruity with very little pine or resinous aromas. Malt character is slightly bready. No alcohol, DMS, or diacetyl are perceptible. Beer pours a muddy copper color. Extremely hazy with hop compounds. Beer is capped with a bright white, thick, persistent head. 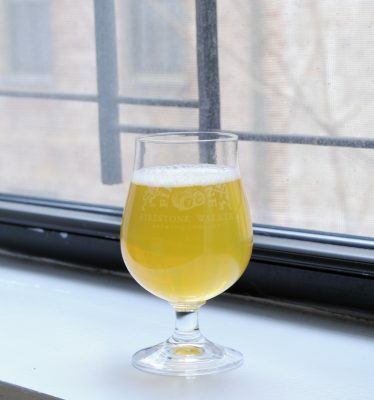 Taking a swig from the tasting glass fills your mouth with huge, round, hop flavors. The flavors are very fruity and tropical, although there is a slightly biting, resinous, bitterness on the finish. There is a bit of residual sweetness that keeps the beer feeling slightly full and heavier than I would like. As the beer warms, some warming alcohol dances across the palate. Medium body and carbonation. Some light hop astringency is present on the finish and detracts from the overall drinking experience. The hops seem to lend a creamy texture to the mouthfeel. This beer pushes the level of hoppiness that I am able to enjoy almost to the breaking point. The beer is young and brash with bold assertive flavors that come off a touch green. It is very much in the same vein as beers like Pliny the Younger, which are best enjoyed in small glasses and shared with friends.